Fall was definitely in the air for Show and Tell Saturday. 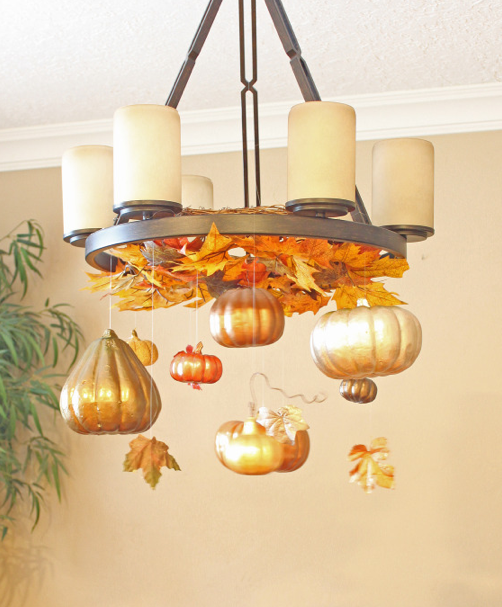 Here are some of the fun Fall crafts that people linked up this week. The Pumpkin Mobile pictured above is from The Rooster and The Hen. I love the Fall oranges and golds. But it would look fun in blues like these glamorous gourds from Landee See Landee Do also. If you have a little girl that will let you put bows in her hair, these cute ribbon pumpkin clips from Delicate Construction would be a fun project for you. 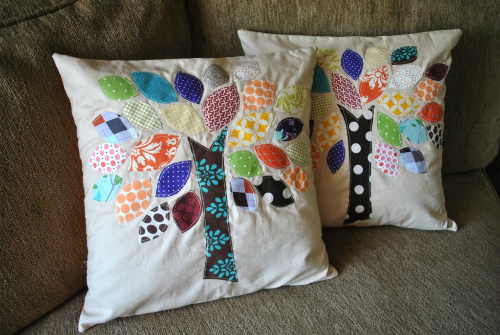 I love all of the fun colors and patterns in these Fall pillows from Pink Stitches. And Homemaker on a Dime dressed up some dollar store pumpkins to create this Autumn pumpkin display. And I love the idea for these leaf stenciled pumpkins from Rips in My Jeans. They would be great on your front porch. There are a ton of other great ideas that were linked up for Show and Tell Saturday, so spend some time perusing them, but don't forget to also enter to win the two giveaways that are going on right now. You can win a $100 Walmart gift card from BHG or win a $100 Visa gift card and a Don't Fret the Sweat gift pack (that is full of really cool stuff if you happen to be a Mom). OMG!OMG!OMG! 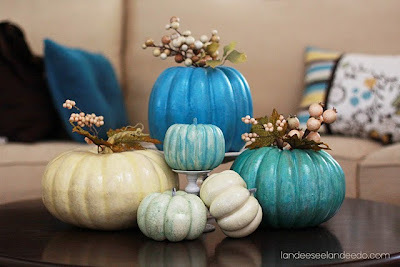 Thank you sooo much for featuring my stenciled pumpkins!